Paula Benoit of Phippsburg, former state senator and Republican nominee in the 2013 special election for Senate District 19. 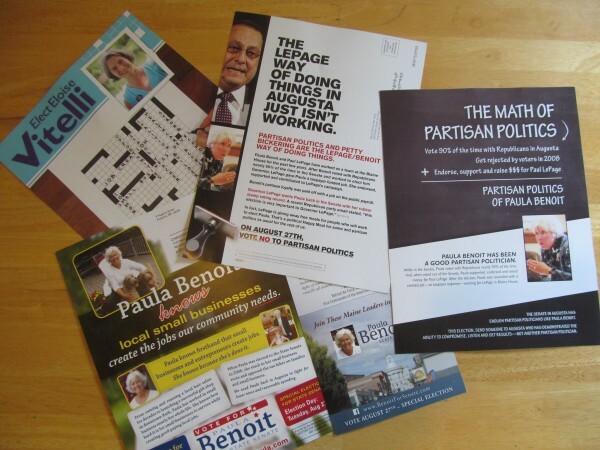 Shown above are some of the mailers circulated in the Senate District 19 special election scheduled for Tuesday, August 27, 2013. The candidates are Republican Paula Benoit, Democrat Eloise Vitelli and Green Independent Daniel Stromgren. AUGUSTA, Maine — As controversy over Gov. Paul LePage’s comments during a recent campaign fundraiser in Belgrade rages, political attention is focused on next week’s special election for a Maine Senate seat in Sagadahoc County. The race to replace Senate Majority Leader Seth Goodall, who resigned in July to head the Northeast region of the U.S. Small Business Association, pits Republican Paula Benoit of Phippsburg against Democrat Eloise Vitelli of Arrowsic. Green Independent Daniel Stromgren of Topsham also appears on the ballot. Benoit said Thursday that LePage’s alleged comment about President Barack Obama hating white people has been overhyped by the media and is distracting voters from more important issues such as jobs, taxes and economic development. Several GOP insiders, however, have told the BDN that there is grave concern within the party that the latest LePage controversy will tip the race toward the Democrat Vitelli, so no one will talk about the issue publicly before the election. Neither the governor nor his staff will discuss LePage’s comments, which the governor denied making on Tuesday. When reached Thursday by the BDN, LePage political adviser Brent Littlefield again declined to discuss the fundraiser. “As was previously reported I was not in attendance at that event to hear remarks,” wrote Littlefield in an email. Democrats are seeking to make the Senate race a referendum on LePage, a strategy that appeared to work in the 2012 election when they regained control of the Maine Legislature after losing it in 2010 when LePage was elected governor. Maine Republican Party Chairman Rick Bennett said the race is the Democrats’ to lose. Campaign literature circulated in recent days — especially that paid for by the parties and their allies, which the candidates by law have no control over — confirms that Democrats are trying to link Benoit to LePage. A separate mailer funded by the Vitelli campaign makes no mention of LePage or Benoit. A mailer from the Maine Republican Party on Benoit’s behalf focuses on her support of small businesses and opposition to tax increases. There is no mention of LePage. “Paula Benoit has a plan: Get government out of the way and let our small businesses create jobs for Maine families,” reads the mailer. Nearly $126,000 has been spent on the campaign by independent groups. Of that, about $76,000 has benefited Vitelli versus about $50,000 for Benoit, according to the Maine Ethics Commission’s website on Thursday afternoon. Benoit, who said she told the Republican Party before becoming a candidate that she would drop out if they went negative, said Thursday that while she is a supporter of many of LePage’s initiatives, her actions as a senator are her own. Ben Grant, chairman of the Maine Democratic Party, said if that’s true, Benoit would be in a class of her own among legislative Republicans, who earlier this year sustained 78 of 83 LePage vetoes. Bennett said that’s not how Maine voters typically make their decisions. Vitelli said she is unsure what effect LePage will have on the election. The Senate seat, which represents all of Sagadahoc County and the town of Dresden in Lincoln County, is seen as one that could go either way in any election, despite the fact that Democrats now hold all of the county’s legislative districts. Before Goodall’s 2008 victory over Benoit by 162 votes, earlier versions of the Sagadahoc County district were represented by Republicans in the Senate dating back decades. Goodall retained the seat in 2010 against political newcomer David Kaler of Bath by a margin of 1,263 votes with a total of nearly 18,000 ballots cast. He easily won against Jeffrey Pierce of Dresden in 2012. Goodall served as Senate majority leader from January until he resigned last month to take a presidentially appointed post with the U.S. Small Business Administration. Green Independent Party candidate Stromgren adds a wild card to the race. Voter turnout in special elections tends to fall short of general elections, elevating the possibility that Stromgren, a progressive, could siphon key votes from Vitelli. The special election takes place Tuesday, Aug. 27. Correction: A previous version of this story said that Brent Littlefield declined to say what the governor said at the fundraiser. Littlefield said he declined the topic and was not in attendance at that event to hear remarks.